Classic Hits 103.3 and the Cumulus Media family of stations are teaming up with Denham Springs Mayor Gerard Landry and Wal-Mart of Denham Springs to help our neighbors in Texas who have been impacted by Hurricane Harvey. Beginning this Thursday, August 31st through Friday September 1st, an 18 wheeler will be parked in front of Wal-Mart on Range Avenue in Denham Springs. It is our mission to fill this truck with all the supplies we possibly can. We will be accepting donations from 9am to 8pm each day. We are asking residents of Livingston Parish and the surrounding areas to help us fill this truck with non-perishable food items, toiletries, and other supplies. 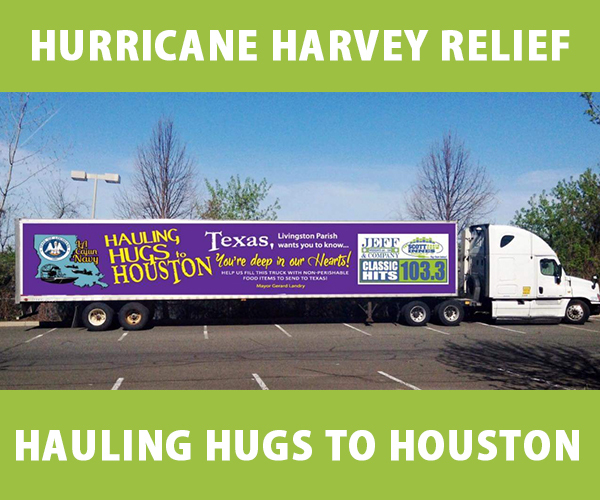 Then, on Monday, September 4th, the truck will be driven to Texas, so that help can be delivered wherever it is needed at the time! After witnessing the historic flood of last summer, we know all too well here in what it’s like to be under water and on top of our roofs! Now, it is our time to work together and pay it forward with Cumulus Media and Classic Hits 103.3!